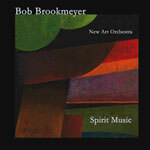 Jazz news: Bob Brookmeyer R.I.P. 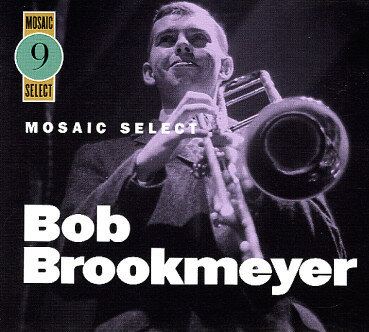 With the sad news of the death of Bob Brookmeyer, vivid memories of our occasionally turbulent relationship flooded my thoughts. We met in 1961 when he and several other prominent jazz musicians were members of the band playing Bill Finegan arrangements for my first album on the Columbia Records label. Although Bob did eventually achieve sobriety, he was then drinking heavily, and he could be short-tempered and petulant when just moments before he'd been wise and funny and keenly observant. 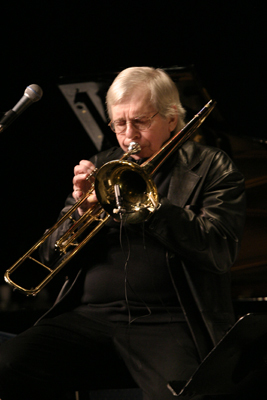 He often appeared at The Half Note, a club on the lower West Side of Manhattan with his co-leader Clark Terry. Some of us fondly called them Mumbles and Grumbles." Our friendship grew and eventually Bob, a passionate football fan at the time, became my personal tutor, patiently explaining some of the more complex and intricate components and strategies. Years later he told me how he tested my girl-friend worthiness" by asking that I accompany him to Sheep Meadow in Central Park one very early Sunday morning. A few musicians gathered there for spirited collisions called touch football. I agreed to act as cheerleader, fetcher of hot cocoa and BandAid supplier. The predictable muscle aches/pains/scrapes ensued, leading to post-game therapy: submersion in a sudsy hot bath. He liked to soak while watching the Giants on a black-and-white portable tv in addition to the sound of a Jets' radio broadcast, cigarettes and beverage of choice within easy reach. On Monday nights, we were at The Village Vanguard where Bob was a member of the ferociously exciting Thad Jones-Mel Lewis Orchestra. The club was always packed out, and I remember standing the entire evening with everyone else who couldn't find a chair. Being a band member's ole lady" did not bestow seating privilege. Bob's alcohol dependence continued, his anger and mood swings increased, and he spent most days drinking and immobile on the sofa, refusing nourishment. Thad began to telephone frequently, hoping to persuade him to write something new for the band. Bob remained unresponsive. In frustration, Thad began to call me at my secretarial job, insisting I do everything in my power to inspire him. Frankly, I was at a loss. The last time I saw B, he and his beautiful wife Jan stopped by on their way to Fenway Park for a Red Sox game. This was to be his first visit to the fabled venue, and he was child-like and very nearly giddy. It was wonderful to see him so grounded and happy at last, and I am so proud to have known him. *Bob's lovely arrangement of Willow Tree" is a included on Thad Jones-Mel Lewis Orchestra Live at The Village Vanguard," 1967 on Solid State. This story appears courtesy of SloaneView . For interview requests or more information contact SloaneView .